One of the many visual forms of the Svefnthorn. The Svefnthorn (Old Norse svefnþorn, “sleep thorn,” pronounced “SVEFN-thorn”) is a symbol that features in several of the Norse sagas and in folkloric magical formulas recorded long after the Viking Age. Its visual form, when described or depicted at all, varies considerably from source to source. Unlike most ancient Norse symbols, it doesn’t seem to have had any one definitive shape. There are also significant differences in how one would go about applying the Svefnthorn to someone, as well as the exact effects that the Svefnthorn would bring about once applied. But the mentions of the Svefnthorn in the literature all have one thing in common: the Svefnthorn was used to put an adversary into a deep sleep from which he or she wouldn’t awaken for a long time. Let’s review the mentions of the Svefnthorn in Old Norse and later Icelandic literature. 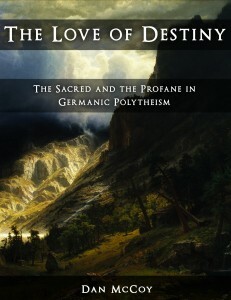 In most of these cases, the visual representation of the Svefnthorn isn’t mentioned. 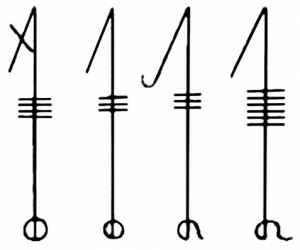 When it is, it’s sometimes the “four harpoons” symbol from the above picture, and sometimes it’s a vertical line with a diamond shape at the bottom. This latter symbol could be an Isaz rune with an Ingwaz rune below it. 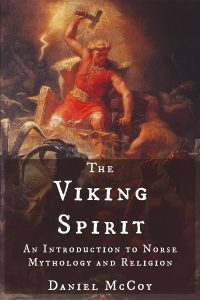 Other Norse/Germanic symbols such as the Helm of Awe also seem to be comprised of runes. 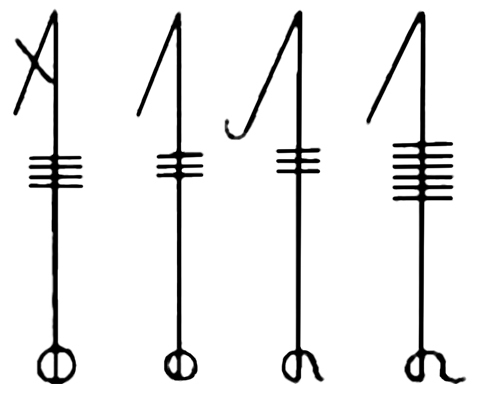 But the significance of this particular runic combination in connection with the Svefnthorn, if any, is unknown, and I’m not going to hazard a guess on this one. Hrólfs saga kraka. Chapter 7. Flowers, Stephen, editor and translator. 1989. The Galdrabók: An Icelandic Grimoire. p. 86.